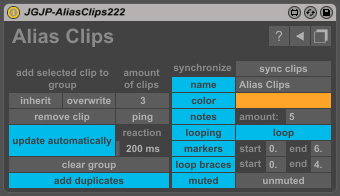 The basic functionality of this device is that each Alias Clips device you add to a Live set controls a group of MIDI clips, these clips can exist in the session view, arrangement view, or both. All MIDI clips in a single group will share properties like name, clip color and MIDI note data. To add a clip to a group, select the clip and then either press “inherit” or “overwrite”. Pressing “inherit” will add the clip to the group and the clip’s properties will be copied to the group and be synchronized to any other clips that might already be in the group. Pressing “overwrite” will add the clip and the group’s properties will be synchronized to the clip, if the group is brand new and had no data, the clip’s current data will be erased and it will be named “no data” until a clip is added to the group with the “inherit” function. Pressing “remove clip” will remove whatever clip is selected from the group. When properties are copied to the group with the “inherit” function, the properties will be shown in the right part of the device, the properties include clip name, clip color, amount of MIDI notes in the clip, looping status, start and end markers, loop start and loop end braces and muted status. Except for the color and amount of MIDI notes, all of these properties can be changed from within the Alias Clips device by typing a new value and pressing enter or toggling on or off. The synchronize switches labeled “name, color, notes etc.” can be used to enable or disable the synchronizing of their respective properties. In the screenshot to the left, clip names, colors and MIDI notes are synchronized while other properties are not, this means they will share the same name, color and MIDI but can have different looping status, markers, loop braces or some clips can be muted while others are unmuted. If you choose to reenable synchronization of any properties you can press the “sync clips” button to use the currently selected clip’s properties to resynchronize all clips in the group. In the bottom left of the device we can control how the clips synchronize when modified. The clips can be set to update automatically or update upon deselect. When set to update on deselect, all modifications made to a clip will only be synchronized to other clips once when the modified clip is deselected or another clip is selected. When set to update automatically, changes will be synchronized in real time, with the “reaction” value as a time buffer, this may result in more individual synchronizations happening but the end result is the same. The “clear group” button frees up all clips in the group and results in the device “forgetting” all previously held properties and MIDI data. Clips that were previously grouped will all become independent of one another and not synchronize. When the “add duplicates” toggle is on, when any clips are copied or duplicated, their copies and duplicates will also be added to the group. The amount of clips that are currently in the group is shown in the middle of the device. The toggle labeled “ping” is a function that shows you specifically which clips are included in the group by flashing their colors, the clips will return to normal when the ping toggle is turned off or any clip is selected. – This device’s functionality is limited when it comes to dealing with changes in several clips simultaneously. When moving clips that belong to an Alias Clips group, please move them one by one instead of selecting multiple clips and moving them. The same thing goes for adding clips to the group, removing them and deleting them. – Don’t have two Alias Clips groups be identical in all synced properties as they could get confused as to what clip is in what group. – At the moment this device is only for MIDI clips, Max for Live doesn’t allow access to audio waveforms, warp markers etc. – This device adds steps to the undo queue, it’s not possible to have this device work without adding steps to the undo queue. On the bright side, manually copying all your changes to every clip across your Live set also adds steps to the undo queue! amazing work. purchased and thanks. +1 vote for the audio clip version. – Does Alias Clips duplicate and sync. automation/envelope settings of a midi clip as well? If not, that would be a cool addition and making the device more complete. If yes, a button for sync/not sync as for the others (name, color, note etc.) would also be a cool addition. – Is it now possible to copy and move two or more clips? Anyway thanks for this already really great device! No it doesn’t sync automation, as of the time of creation of the device (probably still the case) there is no way to do this with max for live, unfortunately. Sorry it won’t be possible to copy more than one clip at a time in the near future (takes a big amount of work and may not even be possible). I will probably not do more work on this as Ableton are likely to implement this functionality natively, they already allow you to edit multiple clips at once in the new version.